Acute pancreatitis (AP) is a rare entity in pregnancy, mainly caused by hyperlipidemia or gallbladder disorders, in which symptoms of cholelithiasis and biliary sludge in many cases precede the symptoms and clinical picture of AP. Diagnosis is based on clinical presentation, laboratory investigations, and modern imaging methods such as abdominal magnetic resonance imaging or magnetic resonance cholangiopancreatography. 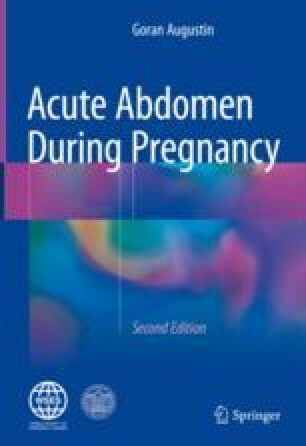 General management of mild AP in pregnancy is conservative and supportive, while severe AP deserves hospitalization in intensive care unit and endoscopic or surgical interventions. Biliary AP can be resolved with urgent ERCP sphincterotomy followed by laparoscopic cholecystectomy preferably in the second trimester when technical conditions are optimal and risk for the fetus and pregnant woman minimal. Hyperlipidemic AP is treated with lipid-lowering methods, sometimes even with a therapeutic delivery. One of the most common types, biliary AP, is associated with better outcomes than non-biliary causes.